The Boo Mushroom is a type of Mushroom that appeared in Super Mario Galaxy and Super Mario Galaxy 2 and turns Mario into Boo Mario or Luigi into Boo Luigi. 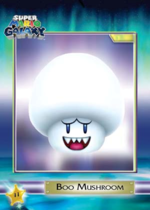 It is a white mushroom with a Boo-like face. It is the least used power-up in Super Mario Galaxy, found only in the Ghostly Galaxy, Sand Spiral Galaxy, and the Boo's Boneyard Galaxy. It is used only once in Super Mario Galaxy 2, in the Boo Moon Galaxy. The Boo Mushroom gives Mario the power to do several things that Boos can do, such as float through walls and fly. He can become intangible if the player shakes the Wii Remote and he can then go through the object. Another effect of being Boo Mario is that Mario will attract other Boos towards it and those Boos will make him lose the form by touching him. The only other way to become Mario from Boo Mario is to go into a light beam. The Boo Mushroom first appears in the Ghostly Galaxy, and also appears in the Sand Spiral Galaxy and the Boo's Boneyard Galaxy. Overall, the powerup appears in three missions. In the mission Luigi and the Haunted Mansion, the Boo Mushroom appears for the first time in the game at the end of the level when Mario has to free Luigi. It is found in an alcove behind a moving light. Mario must then use the mushroom to travel through two grates and free his brother Luigi, though he gets too scared of Mario in his Boo form, so the player has to use a nearby light to turn back to normal and free Luigi. The Boo Mushroom reappears in the mission Choosing a Favorite Snack where Mario has the choice of either the Bee Mushroom or the Boo Mushroom. If Mario chooses the Boo Mushroom he will turn into Boo Mario and have to travel over quicksand. There is a boo at the start who will see Mario and fall in love with him, chasing him until it gives up. Mario must also dodge the beams of several lights to avoid losing the Boo Mushroom. In the mission Racing the Spooky Speedster, Mario must use the Boo Mushroom to race the Spooky Speedster. In the mission Haunting the Howling Tower, Mario (or Luigi) must use the Boo Mushroom to go through walls and progress to the top of the tower. Boo Mushrooms are Skill items in Puzzle & Dragons: Super Mario Bros. Edition. They are used to transform allies such as Red Koopa Paratroopas into Dry Bones or Buzzy Beetles into Bony Beetles, and can be obtained from ? Blocks or dropped by Dark attribute enemies defeated with 10+ combos such as Big Boo, Boo Crew or Boo Trio. When traveling through the Ghostly Galaxy, Mario needs some extra help to navigate this scary place filled with Boos and Bouldergeists. A Boo Mushroom is just what he needs. When Mario grabs this white mushroom, he transforms into Boo Mario and is able to float, and pass through solid walls for a short time. Luigi is shown to dislike this item. When Mario uses it, Luigi mistakes him for a real Boo and is frightened by him. Later, when Luigi uses it, he frowns. The card description for this item states that there are multiple Bouldergeists in the level, by using the name in a plural sense, but there is only one. This page was last edited on April 23, 2019, at 18:41.